Billed as the “Funniest Comedy Ever” on stage, The Play That Goes Wrong doesn’t only tickle the funny bone but rather removes it, fashions a baton out of it and uses it to conduct a full-scale comedy onslaught from beginning to end. Theatre audiences have described The Play That Goes Wrong as ‘Fawlty Towers’ meets ‘Noises Off’. This new comedy hit has won every major London theatre award – the 2014 WhatsOnStage Award for Best New Comedy, the 2015 Olivier Award for Best New Comedy and the 2015 BroadwayWorld UK Winner for Best New Play. The South African production is produced by Pieter Toerien, directed by funny man extraordinaire Alan Committie and features a top-notch comedy cast including Russel Savadier, Craig Jackson, Roberto Pombo, Nicole Franco, Stephen Jubber, Daniel Janks, Ricjhard Lothian and Sive Gubangxa. 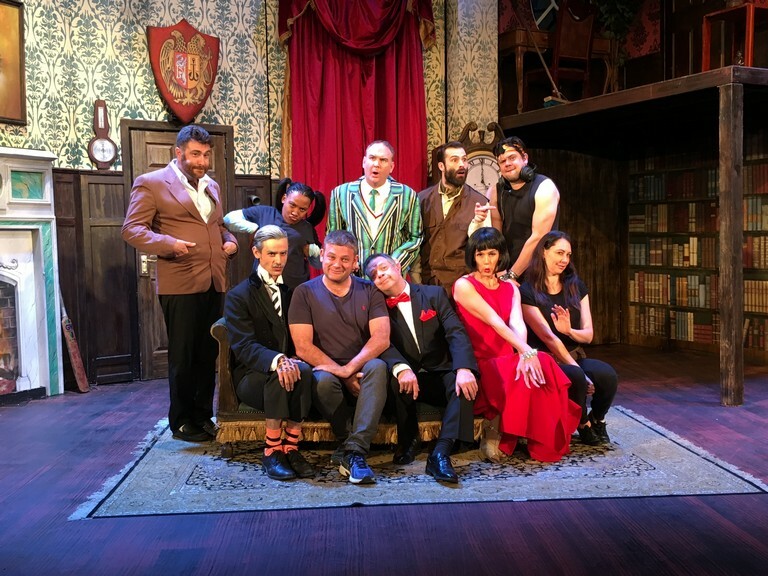 The play’s action revolves around disasters that befall members of the Cornley Polytechnic Drama Society as they endeavor to stage a sketchy old whodunnit called ‘Murder at Haversham Manor’ – the play-within-a-play in ‘The Play That Goes Wrong’. The fictitious play’s cast is a mixed bag of characters, all well meaning but suffering from delusion of grandeur when it comes to their limited acting abilities. Each cast member is however determined to get the play across at all costs. It’s the “all costs” part that holds the promise for an unforgettable night at the theatre. Originally created by the Olivier Award winning London based Mischief Theatre company, the play is written by Henry Lewis, Jonathan Sayer, and Henry Shields, who have become synonymous with brilliantly staged comedic mayhem. Formed in 2008 by these graduates of the London Academy of Music and Dramatic Art, the Mischief Theatre Company took their ambitious concept of madcap fun and turned it into an immediate cult classic. The company debuted their work in 2009 at the London Fringe Festival, where in its infancy were playing to crowds smaller that the cast in number. In 2010 the company won the converted Edinburgh Fringe Festival Best Improvisation Award. The momentum continued to build until the company performed The Play That Goes Wrong on the Royal Variety Show in 2015 in front of Prince Harry. The silent star of the show is most certainly the staging on a seemingly cursed set that appears to sabotage the cast in never getting to the curtain call. The comedy comes when cast and crew navigate the challenge of obeying the time-honored rules of theatre acting and dealing with every technical mishap to occur in one single performance, ever. The Play That Goes Wrong has become the most successful new play of the last decade, clocking in more than a quarter of a million viewing patrons. The play has been licensed to 29 countries and in the last year has been performed in Japan, France and Hungary. It is soon to open in Rome, Shanghai, Bucharest, Warsaw, Melbourne and now Cape Town and Johannesburg, South Africa. * The Play That Goes Wrong is running at Pieter Toerien’s Theatre on The Bay until November 18. Tickets are available through Computicket, or the theatre box-office on 021 438-3301.